Since many of these blogs, and especially the Product group blog, get into the actual features I will not re-post those since you have likely already read it. What I did want to get into is why someone should make the jump to this version whether you are a new BizTalk customer or a customer looking to upgrade. Back in December 2012 I started working with a new organization who was just getting started with using integration platforms to solve their integration requirements. The green light was given to proceed with implementing BizTalk. The next question was which version do we go with? BizTalk 2010 was very mature at this point and was the version that I was using at my previous employer. On the flip side BizTalk 2013 had been in CTP since July 2012 and a subsequent Beta was released in early November. I spent a lot of time with these versions(see my blog posts from this timeframe) and after speaking with the product group at the BizTalk Summit in December we all agreed that BizTalk 2013 was the way to go. My environments are now up, I have the new SCOM management pack installed and we are just finishing up User Acceptance Testing (UAT) before we are officially live. Going live will occur in mid-April. The new cloud based adapters(SB-Messaging and WCF-WebHttp) - Something that was very important to my stakeholders is having a flexible integration platform. They do not have the appetite to spin up many types of integration platforms to perform integration. Having one platform to deal with on-premise integration and another to deal with Cloud or SaaS just wasn’t an option. One of the demos that I did build for the organization when we were deciding on BizTalk was to take an existing SAP interface and expose it on premise. I then took that same interface and exposed a RESTful interface via the cloud (ServiceBus) using the new capabilities of BizTalk 2013. Another example platform flexibility is this organization does use some Cloud/SaaS applications from large well known providers. Having an Integration tool that can easily integrate with these solutions was a must have. Between the core WCF adapters and the new WebHttp adapter I feel very confident that BizTalk can satisfy the integration requirements when interfacing with these Cloud/SaaS applications. SFTP Adapter – This initially was not a big motivator but it has paid off. In the past I have used the /nSoftware adapter to satisfy Secure FTP requirements. The /nSoftware adapters are good and I have blogged about them quite a bit in the past. When we were going through the BizTalk 2013 evaluation there were no SFTP requirements for this company. Fast forward 3 months and 2 SFTP requirements have popped up when dealing with external partners. In the end this turned out very well. I didn’t have to go back to the ‘well’ to ask for more money to buy 3rd party licenses. Instead this is an out of the box adapter which allowed me to build these SFTP interfaces very quickly. Instead of dealing with a procurement process, I can focus on solving the problem. That brings real value to customers. Improved ESB Toolkit integration – I have used the ESB Toolkit in the past, but more from an Exception Management portal perspective. I support any improvements that simplify the installation and reduce the amount of time it takes to deploy. In BizTalk 2013, Microsoft has simplified the ‘core installation’ of the ESB Toolkit. This is a MUCH better experience and I applaud their efforts. I still think there is an opportunity to take this one step further though. Simplify the installation of the Exception Management Portal. I know this is designated as a ‘sample solution’ that you can adopt for your own use but why not improve the experience and give customers a complete experience? Another area of improvement is updating the Alerting Service that will look for exceptions in the Exceptions Database and then send alerts to people who have subscribed to them from the Exception management portal. This Alerting service is extremely useful but is currently broken as part of this release. The Alerting Service has a dependency on Microsoft Enterprise Library 4.1 and the core ESB Toolkit is using Microsoft Enterprise Library 5.0. I haven’t had the time to dig in and find a resolution but my advice would be to include both the Exception Portal and Alerting service as part of the core product and then wrap the same, simplified installation that has been provided for the core framework. Improved SharePoint Adapter experience – In a prior life, I did a lot of integration between BizTalk and SharePoint. I even wrote a couple chapters on it in the BizTalk LOB book. One of the unfortunate realities of the previous SharePoint adapter is that you had to install an adapter web service on SharePoint servers. As you can imagine, the people who are responsible for SharePoint within organizations are not thrilled with this approach. As someone who is walking into a new organization, you are not going to make a lot of friends if you need to install ‘BizTalk bits’ on their servers. In SharePoint 2010, the Client Object Model was introduced to allow developers to programmatically add/modify/remove content from SharePoint (in addition to many other things). BizTalk has now adopted this same model and is leveraging this Client Object Model within the Adapter. The Adapter Web Service still exists to allow for backwards compatibility during migrations but you can now use the SharePointAdapter and specify using the Client Object Model instead. Another benefit of using the Client Object Model approach is BizTalk is now able to use this same adapter to communicate with Office 365. This new organization that I am working with also has some plans to use Office 365 in the future so I am anticipating that the Client Object Model will be leveraged in the near future. I also won’t have to beg the SharePoint team to install the ‘BizTalk bits’ on their on-premise SharePoint servers. 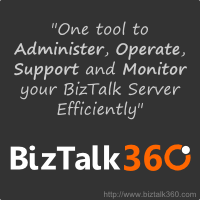 BizTalk Infrastructure as a Service (IaaS) – This is a feature that was included as part of the Beta and will be included as part of the core offering as well. While I am not going to go out on a limb and say that I will leveraging this for production right away but I like to have the option. Having recently gone through the process of creating Dev, Test and Prod environments it can be time consuming. By time consuming, I am not referring to the actual BizTalk installation and configuration. Many other time consuming tasks need to take place including procuring servers (either physical or virtual), storage, Active Directory groups and accounts, SQL Server instances etc. Having the ability to spin up a BizTalk environment in Azure in minutes is attractive. For my needs, I can see myself leveraging these type environments in Project settings where you can’t disrupt the current Dev/Test/Prod Landscape but we will see how this progresses. One thing is certain though, having options is good. There are a lot more features that are included in this BizTalk 2013 release than I have described here. I thought it would be interesting to describe some of my thought process when going through the BizTalk 2010 vs BizTalk 2013 decision. Now that BizTalk 2013 has RTM’d this decision gets even easier. I am very glad that I did proceed down the 2013 route as otherwise I would be missing out on a lot of great features. 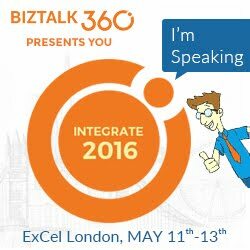 Also, stay tuned for some more announcements from the BizTalk team. They are working on something BIG that fits into the Platform as a Service (PaaS) space. Hint – it is related to this. Once again having options is good and the service that will be offered provides customers more options when it comes to cloud integration. BizTalk developers will be happy as a lot of their existing skillset can be leveraged while building out some new capabilities using this upcoming platform. Stay tuned – it is worth it.